. . . PS-Soft Development Page - the Lima-City.de BOINC team page . . . 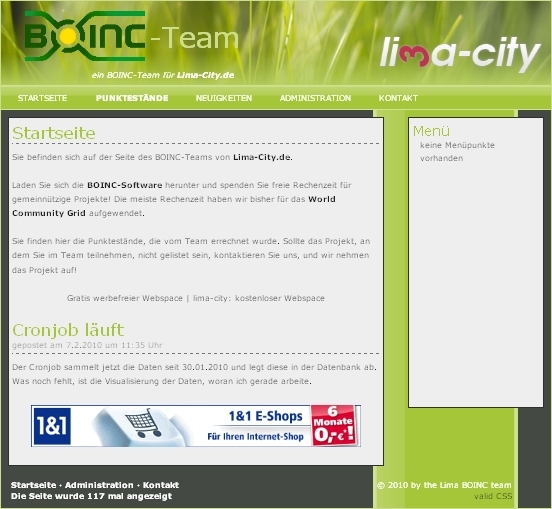 Currently I'm working on a BOINC team homepage for the Lima-City.de BOINC team. It's based on some self written PHP classes that access the BOINC XML interface to get the current credits of the individual BOINC projects to transfer them to a MySQL database. After collecting the credits they should be displayed on the team home page. The page ist in German 'cause Lima-City.de is a German free webhoster with a native German community. last update: 2010-11-16 - 19:41:01. The BOINC homepage topic was visited 2944 times.